Here's the fat FAQ you need. Ah, fat—that most complicated of all nutrients. To answer every question you’ve ever wondered about fat, Menshealth.ph talked to nutritionist Dave Clark Sison, M.S., R.N.D., who tells us why we need it, why we hate it, and how we can live with it. You will die without fat. Fat has many functions. One of its most basic? Neurological—for example, as a covering for your neurons and your brain. So, sometimes, if you have an epileptic patient, he's given a ketogenic diet or a diet high in fat content. Will it really help keep you warm? Yes, fat is also used for thermal regulation. And for cushioning or protection, you also need fat for that. What does it do for us, nutrition-wise? Fat is an avenue for vitamins to be absorbed. For example, the fat soluble vitamins like Vitamins A, D, E, and K cannot be absorbed without fat. Fat can also be an antioxidant source. Omega-3 and omega-6 are essential fatty acids that we need, and the body cannot make that so we have to get them from other sources like fish or plant sources. What’s the deal with saturated and unsaturated fat? If you describe it in terms of chemical composition, fat is characterized by three linked carbon atoms called a triglyceride. 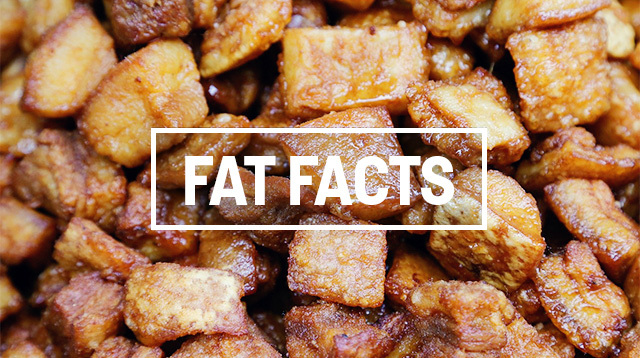 When a fat is saturated (usually animal fat), all the carbon-to-carbon links are occupied by hydrogen. In unsaturated fat (usually in oils), there are carbon-to-carbon links not occupied by hydrogen. According to studies, here's the conflict: When you consume too much of the two kinds of fats, you can choose how you want to die. Too much saturated fat, and you'll die from cardiovascular disease. If you have too much unsaturated fat, you'll die because of cancer from the oxidation and the production of free radicals, since breaking their carbon bond releases unpaired oxygen in the body. Trans fat is what happens when a formerly unsaturated fat is "shot" with hydrogen so it can form a solid and become stable. Trans fat is widely used in food production for stability. That's why even in nutritional recommendations, there's a leeway for that. [For example, in the U.S., a product can still be labeled as trans-fat-free even if it has 0.5 grams of trans fat. -Men's Health editors] I don't believe that you can eat totally clean because you can't live in a perfect world. How much fat do we need in a day? We have a standard percentage allotment for fat use, but it depends on the person, your genetic predisposition, your lifestyle, your age groups. For regular or standard adults, you can allot around 20 to 30 percent of the total energy requirement of an individual from fat. For example, for a certain individual who needs 2,000 calories a day, 20 to 30 percent of that should come from fat. How do I watch my fat intake? Unsaturated fats are recommended to be at 6 to 11 percent of your total daily intake, and polyunsaturated fats from linoleic acids (like fish oils) should be around 2 to 9 percent. That leaves you with 10 percent of your diet for saturated fats. So I recommend that you stick to lean, non-greasy meats. What types of fat should I avoid? Consuming more fish-based and plant-based fat over animal fat would be the best advice I could give. But for me to classify which food is bad and which food is good—that's not so clear-cut. Take beef, which has a high fat content because of marbling. It's difficult to separate the fatty parts from beef. But then again, you need your animal sources because there are nutrients that you cannot get from anywhere else but meats. So I would say that you should just reduce saturated fat intake, and go more on plant or fish sources: Tilapia, bangus, avocado, nuts. Nuts are especially good as snacks, especially steamed or boiled or roasted without oil. Just don't eat too much. This story originally appeared on Menshealth.ph. You Can Turn Your Flabs Into Good Fat!